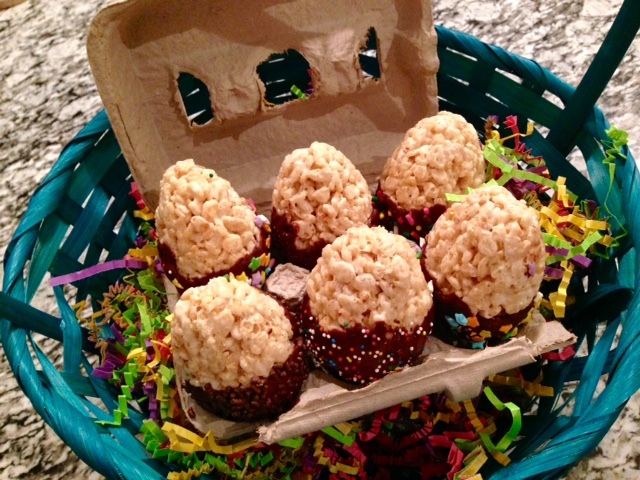 Kids these days… When I was up and coming, Easter involved real eggs dyed in white vinegar with Paz fluorescent tabs. We didn’t have tie-dye, glitter, and definitely no 3-D holographics on our eggs to herald in the spring season. I love hearing stories about how families celebrate the holidays. I’m in love with tradition, and believe firmly that even the weirdest customs (like your drunk brother being forced to put on a rabbit head and dance around the house) should be continued and celebrated. Over the last couple of weeks I’ve heard of a family that hides plastic eggs full of candy outside. Pretty standard, until you factor in that there’s one gold plastic egg with a Benji in it. Apparently the kids trample the lawn on chilly Easter mornings like the bulls of Pamplona. Exercise, competition, capitalism…it’s what the holidays are all about! We didn’t have plastic eggs filled with money or candy, just the plain ole hard boiled variety, hidden around my Grandma’s house. Growing up my sister and I never managed to find all the eggs, and none of the adults ever considered writing down where they hid them. Inevitably, my Grams would find the colorful gems a week later, led to their illusive hiding spots by a sulfurous stench. Holidays are always more fun when kids are around. Their curiosity, excitement, and wonder make the process of hard boiling eggs seem magical. Since I’m away from my own family this holiday, my boyfriend and I decided to make an Easter treat for his niece and nephew. 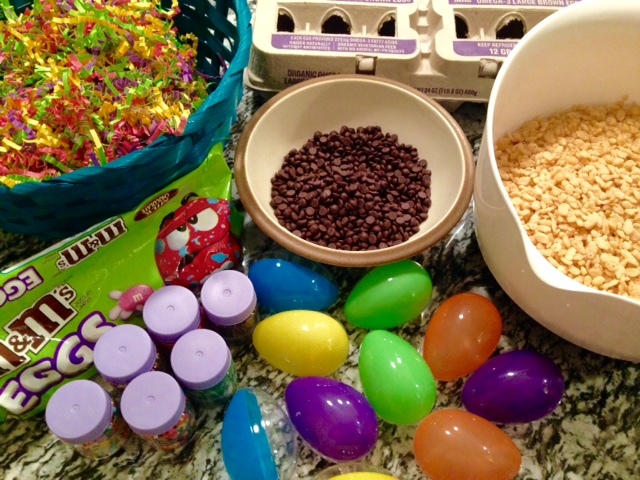 Inspired by a Saturday morning full of Food Network (my weekend ritual), and the simplistic genius of Pioneer Woman Ree Drummond, we set out to make Easter rice crispy treats…obviously. Rice crispy treats are pretty standard. Some brilliant person figured out decades ago that melted marshmallow and rice cereal are together waaaaaaaay more than the sum of their parts. Sometimes I add some really good vanilla and bourbon to the marshmallow to make things a bit more interesting (and boozy; read: interesting), but since we were making these treats for kiddies, I omitted the bourbon. Instead I dunked them in chocolate and covered them in bright, glittering sprinkles. They’re adorable and I was barely able to resist shoving one in my mouth. 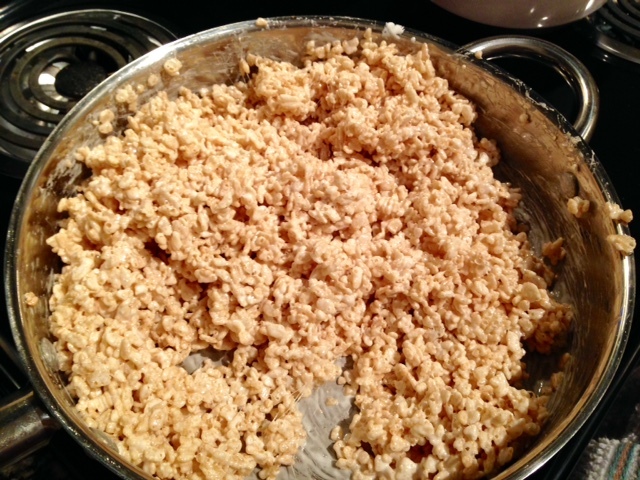 Be warned: making rice crispy treats is not for the faint of heart. Your hands will look like Mickey Mouse with his giant white gloves; several pots, pans, and bowls will be irrevocably sticky; bits of crispy rice will forever be ground into your kitchen mat. It’s pretty worth it though, just look at these beauts!! Melt the butter on low heat in a large pot. Once the butter is completely melted, pour the marshmallows in the pot and stir occasionally, be careful not to let them burn. When the marshmallows have melted, turn off the heat and pour the rice cereal on top, stirring vigorously until the marshmallow mixture is evenly distributed throughout the rice crisps. Let set in the pot for 5-10 minutes to cool slightly. To assemble the eggs, spray your hands and the inside of your plastic egg with cooking spray. 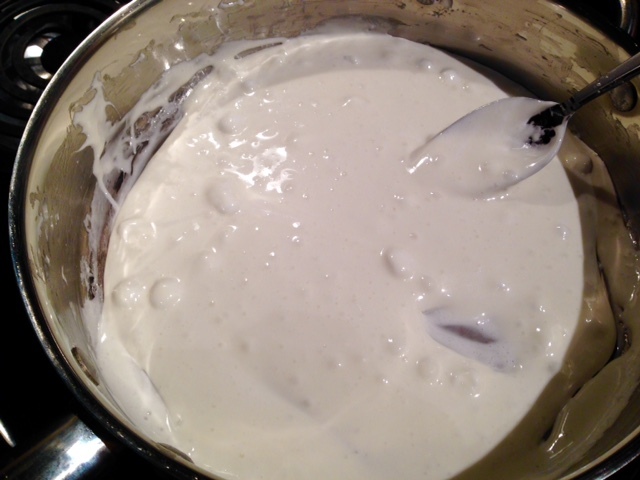 Tightly pack the marshmallow crisp mixture into each side of the egg. Stick the candy of your choice in the center of one side of the egg. 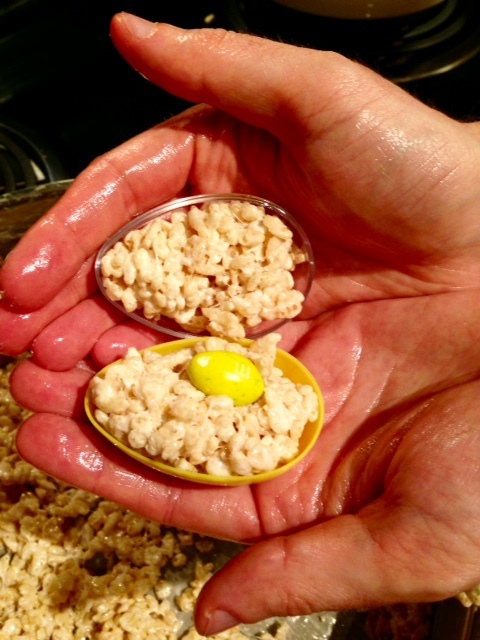 Stick the two halves of the egg together and carefully remove the plastic egg from the rice crispy treat. Use your hands to smooth over any imperfections and then place on a foil lined tray. Complete this process for the rest of the eggs. In a small bowl heat the mini chocolate chips in the microwave for 30 seconds. Remove the chips, stir, and return to the microwave for another 30 seconds. Stir again until the chocolate is completely melted. 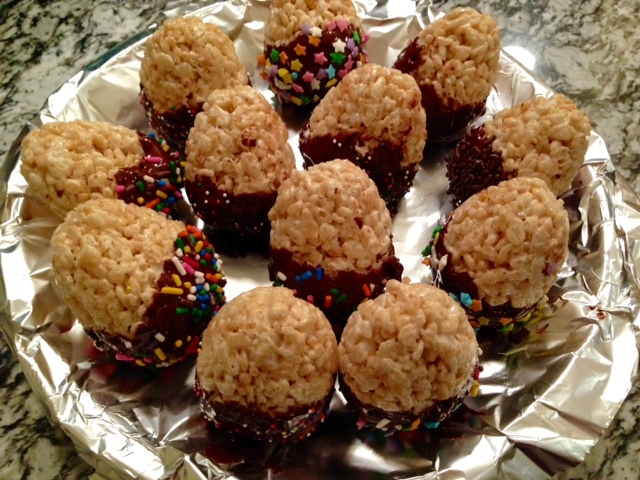 Dunk each rice crispy egg in the chocolate. I went for half way, but you could certainly submerge the entire egg in the chocolate for a more decadent treat. While the chocolate is still wet, cover with your favorite colorful sprinkles. Return to the foil lined tray and place in the refrigerator to harden.